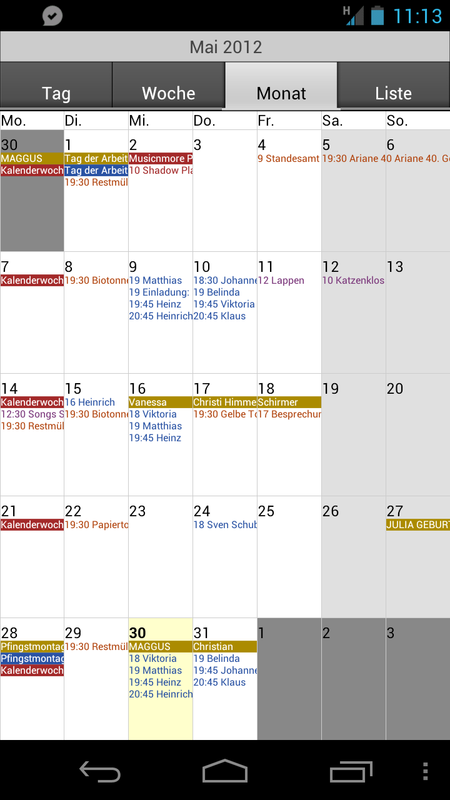 The official Google calendar app is not doing a bad job under Android 4.0. Still, users who are looking to add a lot of details to their diaries may find the stock Google calendar app to be somewhat limiting, seeing as it doesn't come with many settings options. This is where 3rd party apps come into the picture, and today I decided to revisit an old favourite: CalenGoo. More details after the jump. Check out the developers' page for more in-depth information. Many of you will be looking to sync with the Google Calendar and/or Google Tasks. Calendars that are connected with the account on your smartphone or tablet will be linked up automatically and appear in CalenGoo without you having to do anything. In order to sync Google Tasks you will have to eneter your account details in the settings. Once this is done, syncing works like a charm; same goes for syncing with the calendar. The app can be used even if you decide not to sync; syncing is not absolutely necessary. 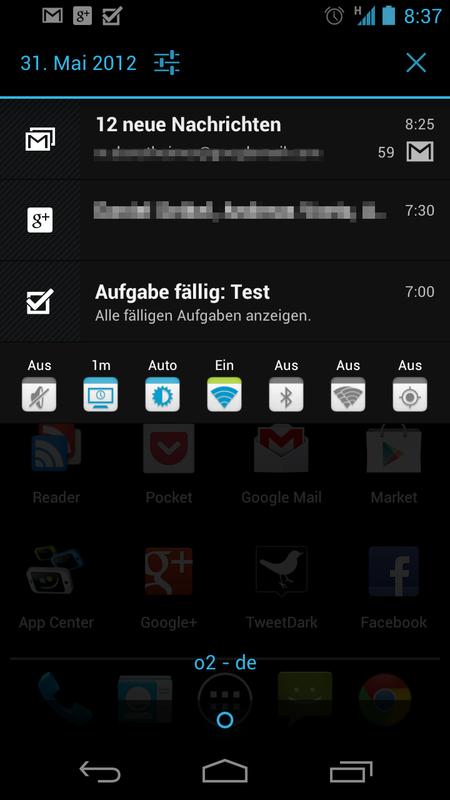 CalenGoo can display up to four different calendar views. Choose between a detailed view of your day, week or month, or else a list of all your upcoming events. The landscape view affords you a very good overview of your appointments. You will appreciate this function if you also use Google to organize your tasks. CalenGoo will display all of your tasks in the calendar. Now, you might be thinking that the security issue is set on the back burner at this point, as the app needs your Google login data to perform this function. One would think that in the era of OAuth and AuthSub this type of thing could and should be circumvented, and cautious users may be seeing a red flag at this point. Never fear, I’ve done a bit of research so as to soothe your minds, my faithful readers! Syncing tasks with CalenGoo can also be done using the safe AuthSub process. In order for this to work you first have to activate synchronization within your Google Calendar account. This authorization is then automatically transferred. Widget—the word sends most Android lovers little hearts aflutter. CalenGoo makes the most out of the widget feature. There are 27 (!) to choose from. Widgets can be personalised and accessorised to your heart's content, suing everything ranging from style, colour, transparency, font and more. CalenGoo is simple and functional, plus controls are easy. It’s an app that will bring more structure into your planning. On the whole, it's pretty impressive to see all of the useful features and settings options the devs have managed to pack into this calendar app. Navigating CalenGoo feels very much like navigating the Google calendar app, i.e. you swipe through the various views. For more options, click on the appointment you are looking to edit. Long press for moving an appointment. Ah, Drag’n’Drop, we love you! Shifting events around isn’t always hassle free when using other apps… but it is when using CalenGoo! CalenGoo is a real timer-saver: use Drag’n’Drop to move events around without much ado. Syncing with the Google Calendar occurs automatically, meaning that you will see changes you’ve made online after only a few seconds. Swiping also works a charm, making it fun to use a calendar—who would’ve thought? A double tap is needed to activate every function or view every appointment—something most of us aren’t used to. This came across as somewhat counterintuitive to me. However, once I got used to it I actually found it to be easier to use than what I had been conditioned to by using other calendar apps. CalenGoo is a great app for users who tend to work with their calendar app(s) on a regular basis. There are so many options and lots of widgets to help make your user experience completely tailored to your personal preferences. On the whole, I'm not surprised CalenGoo is achieving such unanimous praise in the Market. CalenGoo performed really well throughout the testing phase. Syncing with Google Calendar was really fast and easy, just the way we like it! CalenGoo can be dowloaded for € 5,39 from the App Center. A fair price considering that the app is a regular little powerhouse. Stop press: CalenGoo is our app of the week and is available for € 2,69 for a limited time only.